This is for Project Tuesday--another few moments grabbed in my card room. Supplies: DCWV Christmas Stack, Ink: Ranger Archival Ink-Sepia, Stampin Up-Riding Hood Red, VersaMark Ink Pad, Jo-Ann's Clear Embossing Powder, decorative scissors, Stamps: Gina K-Festive Labels, Stampin Up flowers-Pretties Kit, metal gold stickers, gold cord, Stampin Up-Very Vanilla card stock, glue dots. Amazing design and project Beverly, thanks for playing along each week, we LOVE seeing your amazing samples! 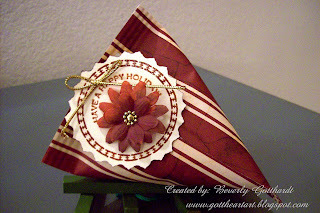 love the project tuesday xmas pouch! Love it! Great idea for a small gift at Xmas! Beverly I love this project! Where did you get the container? Love the colors you used! Great job!